A Cheap and cheerful version of Tie Luo Han (铁罗汉) oolong tea that I grew up with. This is a highly oxidised oolong but it is not as long-lasting and multi-layered as the Heritage Tie Luo Han we will be serving at Teanamu. Happy year of the Golden Rabbit! I’m now in Singapore celebrating Chinese New Year with my family. It has been great fun so far meeting friends and relatives. The heat is getting to me a bit but I mustn’t grumble. I’ve been helping my mom with various preparations for the New Year. We have lots of rituals to follow. If you ask her, she will say she is a Buddhist, but she has been a Taoist for so long that she is still keeping up many Taoist rituals till this day. 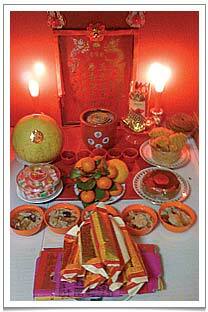 One Taoist ritual is making offerings to the various gods and demi-gods. According to Taoist belief there is a god assigned to practically everything. On the eve of Chinese New Year, all these gods go to report on each family to the Heavenly Emperor. Hence, all clever housewives know that they should make an offering of a sweet caramel glutinous rice cake to the “Zhao Sheng” (灶神 Kitchen God) so that he will have a mouthful of the sticky rice cakes and will not be able to say anything (bad) to the Heavenly Emperor! Offerings to the Earth God at my mom’s place. There are five cups of Tie Luo Han tea behind the well laid-out plate of clementines. I’ve always teased my mom when she prepares and burns “gold paper! to these gods, notably to the “Cai Sheng” (财神 God of Fortune). Why on earth does he need more “gold paper” money than we do? Shouldn’t he have unlimited access to funds at the wave of his wand? My mother of course wouldn’t have it and I have learnt to keep my mouth shut and just do what she says. The picture you see is the offerings she has made to the “Tu Ti Gong” (土地公 Earth God) at home. The fact that we actually live in a 5th floor flat and therefore some distance away from the earth is of little significance! She has made a sweet soup (not unlike the Laba congee) of barley, gingko nuts, white fungus, Chinese dates, longans and candied winter melon strips, offered up in little plastic bowl. The round, brown, glutinous rice cake on the right has red paper on it. Behind the glutinous rice cake, you can see she has also made a steamed, fluffy, caramel-flavoured cake that splits open during steaming. If someone says inauspicious things or has inauspicious thoughts, the cake won’t split and the whole batch would have to be thrown away. The split resembles happy laughing so it is absolutely crucial! Food aside there are five cups of Tie Luo Han tea behind the well laid-out plate of clementines. What you see here is lower quality Tie Luo Han, the stuff that’s typically nowadays sold specifically for offering to gods. In the past, this would have been the daily beverage most Chinese families would drink and use in all sorts of offerings, including wedding tea ceremonies. A big pot of it would be brewed in the morning and drunk throughout the day in place of water. These little paper parcels of Tie Luo Han tea is a highly oxidised oolong but is not as long-lasting and multi-layered as the Heritage Tie Luo Han we will be serving at Teanamu Chaya Teahouse. It can be described as having a singularly fiery and roasty flavour profile with very little umami sweetness. The leaves are largely crushed but still visible unlike the tea in regular, supermarket tea bags. 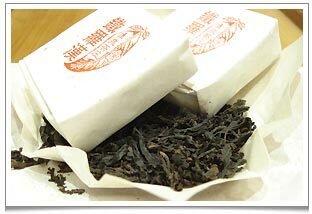 This tea also contains a lot of stalks that may not necessarily be from the tea bush. As they are roasted at a higher temperature, the dried leaves are black but without the lustre that one finds in higher grades of the same tea. I suppose they resemble those teas that we enjoy in Chinese restaurants in the UK – a bit of flavour and better than tap water! 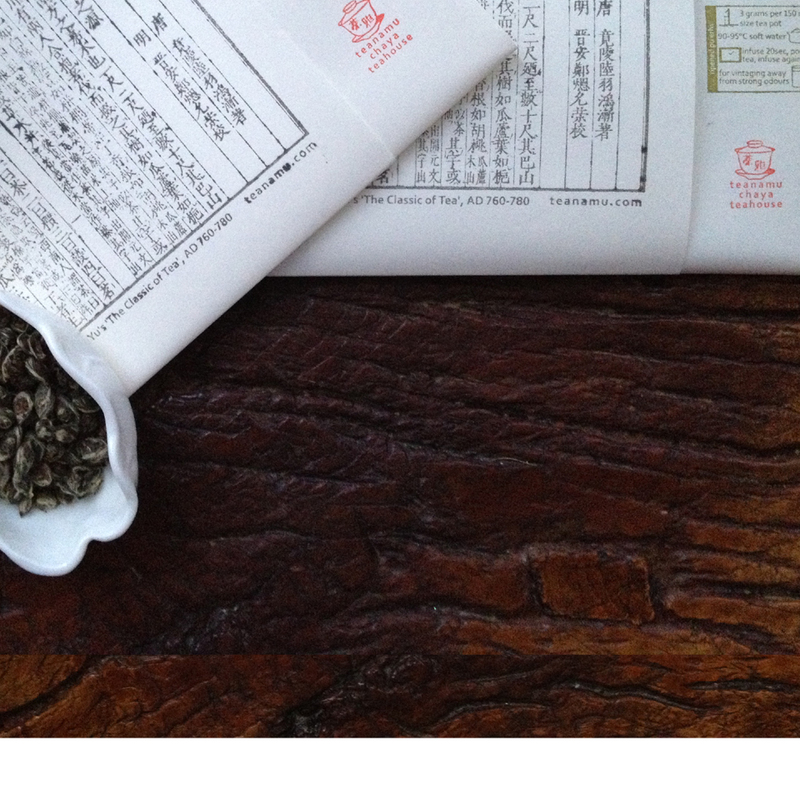 What I love (perhaps it reminds me of my childhood) is the simple paper wrapping of these low cost tea leaves. I have always wondered how they manage to wrap them in neat little paper parcels (4cm by 4cm by 1.5cm thick), each one just nice for a small purple clay pot and good for just one or two infusions. I suppose this could be the early version of “single sachet” tea! Nonetheless, I still like this tea as I have drunk it since young and quite like the flavour. More importantly, it reminds me of home and all my mom’s Taoist rituals. And yes, it helps to counteract the eating excesses of the New Year! enjoyed reading your article… so refreshing, personal & am still learning more on our chinese customs.